Ever since my first visit to the camp I have been struck by the plight of the women who are not allowed to leave their shelters. These are the ones with the most traditional families and their menfolk, maybe traumatised, maybe ashamed, maybe afraid of the neighbours, believe it is best for them to stay int heir shelters. So, cut off from family and friends, having left behind most of their possessions, they sit inside their safe but uninspiring shelter waiting for the days to go by. I haven’t been in situations as difficult as this myself, but sometimes things have been a bit tough. And then having friends around, or someone who I feel I can complain to, vent to, cry on the shoulder of, has made the biggest challenges have felt a little more manageable. I want the women in the camp to have some of this. I also learnt, from some of the projects I came to know when I was a trustee for Womankind Worldwide.that once women form connections, things get done. Whatever the original reason – a sewing circle, a mother and baby group – once they gather they form connections and strengthen each other. In practical ways – an experienced mother helping a new mother or one who cans we teaching one who can’t, and in social ways – two mothers chatting while their children play together, young women discussing how to handle relationships with men. Building resilience and hope together. When I came last January I tried to do that with micro sewing circles – but I had underestimated how hard it is to sit with people we don’t know and not be very good at something. It can feel humiliating. So it worked to some extent with 12-14 year old girls but not with the adult women. So I am going back tomorrow with a new idea. Over the last two days we have been foraging and building a curious contraption. Yesterday in Amman we walked the backstreets trying to find some of the things we needed. A length of rope. Four sturdy wheels. A drill bit. Glue. Everybody was keen to help. When one shop owner didn’t have what we needed he would run up and down the street to the other shops until he found someone who did. We could only find two wheels, but the shopkeeper promised he could find more if we could come back in three hours. We did, and he had. We became expert at explaining what we needed across the language barrier and by today we were ready to transport everything to Azraq and build! Artmongering with Refugees: Chapter One from Matt Allen on Vimeo. Olfat, one of the social workers from the camp came by to say hello. I had tried to explain the idea to her with a sketch last year and she hadn’t really imagined how it could work. Today when she saw the kit she was thrilled. “I don’t like it,” she said, “I big like it!”. And she immedately saw how it could help the women in the camp who weren’t allowed to go to the community centre. 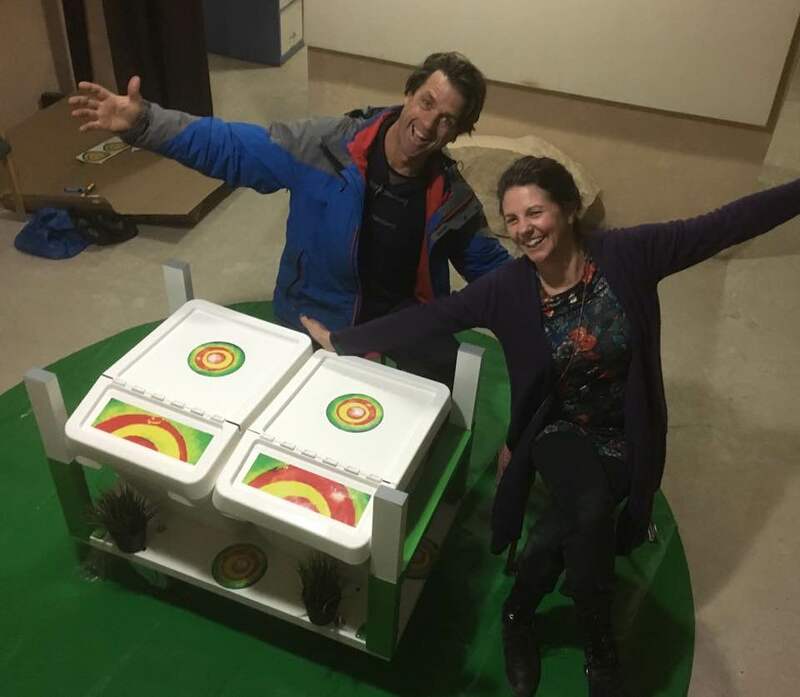 And that the ideas she had tried over the last year – like community radio – that had foundered on one practicality or another, could be overcome with this robust trolley carrying a battery powered sound system and a bin with a 3m wide green mat and 8 red stools.